Abstract: The Flavivirus genus (Flaviviridae family) contains important pathogens such as yellow fever virus, Japanese encephalitis virus, St Louis encephalitis virus, West Nile virus, Usutu virus (USUV), Zika virus, and dengue virus, many of which constitute a worrisome threat to global human and animal health. USUV is transmitted by mosquitoes and, as any other flavivirus, is an enveloped plus-strand RNA virus. The virus was first isolated from Culex neavei mosquitoes in South Africa in 1959 near the Usutu River, from where it takes its name. Since then, the virus was confined to Africa until its first detection in Austria in 2001, although it was probably present in Europe since 1996 or even earlier. After that, USUV has spread throughout Europe, causing a considerable mortality among birds and a few neurologic cases in humans. The main USUV natural hosts are birds, but infection has also been reported in other vertebrate species, including humans. The fast spread of the virus through the continent, the relatively high mortality caused in birds, and the recent neuroinvasive human cases related to USUV infection reported in Europe have raised serious concerns about its possible consequences for public health. Here, an updated review of current knowledge about this emerging pathogen is presented. Figure 1 Usutu virus phylogram trees. Notes: (A) Representative phylogram showing the genetic relatedness between different flaviviruses. Accession numbers are displayed in the tree. The scale indicates 0.8 nucleotide substitutions/site. (B) Representative phylogram showing the genetic relatedness between geographically and temporally different Usutu virus strains. Accession numbers, country, and collection date are displayed in the tree. The scale indicates 0.2 nucleotide substitutions/site. The trees were based on complete genome sequence, built from a multiple alignment using Clustal omega and Phylogeny.fr. Figure 2 Schematic view of the genomic organization of USUV. Notes: The single ORF (boxes) that encodes both structural (C-prM/M and E) and NS proteins (NS1, NS2A, NS2B, NS3, NS4A, NS4B, and NS5) is flanked by two UTRs. Abbreviations: C, capsid; E, envelope; ORF, open reading frame; prM/M, pre-membrane/membrane; USUV, Usutu virus; UTRs, untranslated regions. Cysteine residues within the polyprotein are well conserved among USUV strains with only slight differences.21 Whether these changes affect the virus assembly or RNA replication is still unknown. Putative N-glycosylation sites (Asn-Xaa-Ser/Thr) have been identified at aa positions 118 and 154 of the E protein3 and seem to be conserved among all USUV strains. In this sense, as in other related flaviviruses, functional significance of N-glycosylation sites has not been elucidated, as deglycosylated flaviviruses can keep the same antigenicity,22 and their role in flavivirus life cycle still need to be clarified.23–25 Flaviviral structural proteins are essential in viral RNA replication.26 Thereby, the C protein associates with the genomic RNA to form the core of the virions.20 The coexpression of the flavivirus prM and E glycoproteins induces formation of virus-like particles (Figure 3A) commonly referred to as recombinant subviral particles (RSPs) which, despite their reduced size, share both antigenic and immunogenic properties with whole virions.27 The E protein, as reported for other flaviviruses, plays a role in cellular tropism, helping the virus to bind to specific receptors and initiate an infection.28 The antigenic characteristics of the flaviviruses are mainly determined by their E protein structures.29 In this regard, using computational tools, the presence of potential B-cell and T-cell epitopes on the E protein has been predicted,30 showing a sequence identity of ~77.26% and a sequence similarity of ~85.02% with the E protein of WNV. Figure 3 Transmission electron microscopy of USUV RSPs and virions. Notes: (A) Negative stained TEM image of purified Usutu RSPs. (B) Negative stained TEM image of Vero cells infected with USUV showing VP and electron-dense Vi. Abbreviations: RSPs, recombinant subviral particles; TEM, transmission electron microscopy; USUV, Usutu virus; VP, vesicle packets; Vi, virions. USUV infectivity has been tested in several human and animal species cell lines. First reference of USUV growth in a micro-cultured method was performed in pig kidney cells (PS) in 1969.33 Later on, the susceptibility to USUV infection was assessed in various cell lines and cultures, including HeLa (human), Vero (simian), ED (equine), PK-15 (porcine), RK-13 (rabbit), MDBK (bovine), MDCK (canine), DK (canine), CR (feline), BHK-21 (hamster), BF (hamster), C6 (rat), TH1 (turtle), primary goose embryo fibroblasts, and horse kidney cells.34 Although replication was detected in all mammalian cell types, only Vero, PK-15, and goose embryo fibroblast cells developed cytopathic effects. Rodent cell lines derived from the bank vole were also susceptible to infection with USUV.35 More recently, 13 additional human and animal cell lines have been shown to be susceptible either to USUV or Zika virus.36 These cell lines (Tb 1 Lu, DF-1, Sf 1 Ep, EA.hy.926, FoLu, Pl 1 Ut, OHH1.K, OK, DN1.Tr, LLC-MK2, BT, WCH-17, and Mv 1 Lu) included some domestic and peridomestic representative species. Even though both viruses replicate to significant titers in almost all cell lines, only 8 out of these 17 showed cytopathic effect. Susceptibility of ex vivo human neural cells to USUV infection has also been tested, showing that neurons, astrocytes, microglia, and induced pluripotent stem cells (IPSc)-derived human neuronal stem cells display strong cytopathic effect after viral infection.37 The ability of USUV to replicate in cells of such different origin could be related to its transmission cycle, which includes replication in mosquito vectors and in a wide variety of mammalian hosts, such as birds, humans, and other vertebrates. 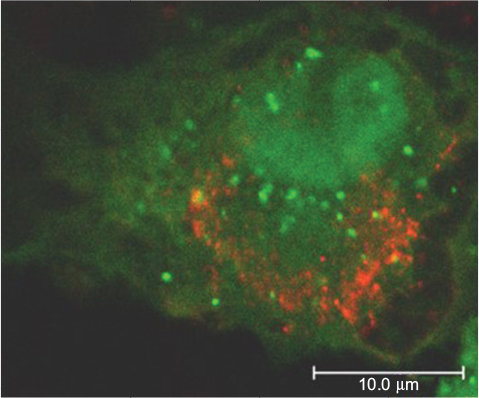 Figure 4 Confocal image of Vero cell transfected with the autophagosome marker GFP-LC3 plasmid and infected with USUV (red). Note: Green LC3 aggregates indicate the induction of autophagy in the cell. USUV, as other related flaviviruses such as WNV,19 is mainly transmitted by ornithophilic Culex mosquitoes. In fact, USUV was isolated for the first time in 1959 from a female adult Culex neavei mosquito in South Africa.47 Later on, the virus has been isolated from several mosquito species throughout the African continent, mainly in countries where surveillance programs are implemented, such as Senegal, CAR, Burkina Faso, Cote d´Ivorie, Nigeria, and Uganda,48 and more recently in Kenya.49 Experimental oral infection of C. neavei has been demonstrated and, although virus transmission to bitten mice was not initially observed, USUV infection, dissemination, and transmission rates were later on reported, showing the importance of high virus titers in the blood meal for virus infection.50 In addition to C. neavei, USUV has been also isolated from other Culex species, including Culex quinquefasciatus, an anthropophilic vector that was directly implicated in the emergence of the virus in Europe,48 and from Aedes mosquitoes. In 2001, USUV was detected for the first time out of Africa in dead birds from Austria;62 however, retrospective analysis of preserved tissue paraffin blocks from Italian wild birds found dead in 1996 resulted in the amplification of USUV RNA, thus indicating that the virus was already circulating in Europe at that time.14 Later on, as part of WNV serosurveys conducted in different countries, USUV seropositivity has been found among different birds species (Table 1), mainly among blackbirds (T. merula). Along the summer of 2006, dead birds were found around the Zurich zoo in Switzerland and further investigations point to USUV as the causative agent. In the following year, several birds from the zoo died of USUV infection.76 Consequently, a study was conducted in sera from 372 birds collected in 2006 and 2007 in the zoos of Vienna, Basel, Zurich, and Budapest. A seroprevalence of 8.75%, 6.59%, 5.3%, and 0% specific neutralizing antibodies was found in the samples from these zoos, respectively,77 with the highest USUV seroprevalence found among owls (S. nebulosa). A flavivirus surveillance study carried out in southern Spain in 2011–2012 in hunted red-legged partridges (Alectoris rufa) and common pheasants (Phasianus colchicus) reported a 13% prevalence of anti-USUV neutralizing antibodies.81 In the same area and year, USUV detection in two song thrushes (T. philomelos) confirmed the virus as the cause of the diagnosed encephalitis in these birds.12 At that time, USUV was also detected among several resident and migratory bird species in Germany,82 and since then, the virus has been frequently found in dead birds in the southwest of the country.83 USUV RNA-positive samples were amplified from blackbirds, thrush (Turdus sp. ), long-eared owl (Asio otus), European green woodpecker (Picus viridis), inca tern (Larosterna inca), great gray owl (S. nebulosa), and northern hawk owl (Surnia ulula) along 2012 and 2013. Neutralizing specific antibodies were also found in a mute swan (Cygnus olor) collected in Serbia in 2012.84 The same year, USUV RNA was detected in a Eurasian bullfinch (Pyrrhula pyrrhula) held in captivity for its entire lifespan and in a wild great spotted woodpecker (Dendrocopos major), both with neurologic signs, in Belgium.85 The virus was also isolated from a blackbird found dead in Brno (Czech Republic) in 2011, and viral RNA amplification was achieved from two other blackbirds 1 year later in the same area.86 In 2014, during a WNV surveillance conducted in Greece, USUV seropositivity was reported among pigeons (Columba livia domestica).87 One year later, a French surveillance network reported increased fatalities in blackbirds in eastern France, and molecular analysis detected USUV in five bird tissues.88 The spread of USUV throughout the continent has been further supported by its recent emergence in the Netherlands, where an outbreak, with a considerable bird mortality in blackbirds and great gray owls, has been recently reported.89 In addition, widespread USUV activity was also described in 2016 in Belgium, France, and Germany, with 17 live and 147 dead USUV-positive birds in these countries.13 Phylogenetic analysis indicates that the virus was most probably introduced from Germany by infected semi-resident birds, although the role of migrating birds or mosquitoes cannot be excluded. All these data clearly demonstrated a spread of USUV activity throughout the continent (Figure 5). Figure 5 Map showing the spread of Usutu across Europe from 2002 to 2016. Histopathologic and IHC studies in birds have frequently described hepatomegaly and splenomegaly.12,54,62,76,82,89 Histologic lesions have also been reported in heart, liver, kidney, and spleen. Slightly swollen liver and hyperemic lungs, as well as discrete histopathologic lesions in heart and liver, neuronal necrosis, and leukocytolysis in brain blood vessels are less frequently observed. A more detailed study70 described unspecific gross lesions, such as general organ congestion, and the presence of acute hepatitis with multiple inflammatory and necrotic foci, focal necrosis in the spleen, perivascular infiltrations in the kidney and heart, focal myocardial degeneration, vacuolar degeneration of tubular epithelial cells in the kidney, and perivascular and perineuronal edema in the brain. Likewise, immunoreactive accumulation of glial cells in the brain was detected by IHC, and multiple IHC-positive foci were present in the cerebral cortex. USUV antigens were also observed, to different extents, in the heart, lungs, spleen, pancreas, and intestines. Another study conducted in two thrushes with severe encephalitis showed congestion and Purkinje cell necrosis, gliosis, satellitosis, neuronophagia, and endothelial cell swelling and vasculitis, along with some lesions in the kidney, liver, and spleen.12 All these findings indicating USUV replication in a large number of organs and tissues point to multiorgan failure as the cause of death. In 2009, the first case of USUV infection in humans was reported in Europe. A patient with a neuroinvasive infection with diffuse large B-cell lymphoma who presented with fever and neurologic symptoms was diagnosed with meningoencephalitis in Italy. USUV was amplified by RT-PCR from the cerebrospinal fluid (CSF), serum, and plasma samples of the patient.90 The same year, a case of USUV-related illness was reported in Italy in a woman who received an orthotropic liver transplant as a final consequence of a thrombotic thrombocytopenic purpura during an acute episode of USUV infection.91 Later on, the only USUV neuroinvasive infection in humans outside Italy was described in Croatia in 2013 during a WNV outbreak.92 The main clinical features in all patients were headache, fever, nuchal rigidity, hand tremor, and hyperreflexia. USUV neutralizing antibodies were detected in all patients, and seroconversion was documented by enzyme-linked immunosorbent assay (ELISA) in two of them. Virus isolation in susceptible cell culture is the gold standard for virus detection, but it is usually hampered by the short duration and low levels of viremia, and thus, it is not routinely applied for USUV diagnosis. Earlier, the diagnosis was based on complement fixation and agar gel precipitation technique,112,113 and then, viral neutralization tests and immunofluorescence assays were implemented.114 However, as with any flavivirus, cross-reactivity between viral antigens is the greatest drawback for proper serologic diagnosis,19 and thus, sera have to be tested against different related viruses and results have to be subsequently confirmed by different assays, such as immunofluorescence assay, hemagglutination inhibition, or, preferably, plaque reduction neutralization test. A 4-fold increase in plaque reduction neutralization test titers between two sequential serum samples collected 2–3 weeks apart usually confirms an acute infection, and USUV neutralizing titers 4-fold higher than titers to other related flavivirus can usually be taken as a specificity probe. In any case, diagnosis has been mainly based on in-house serologic and molecular tests, since only very recently, a commercial USUV IgG ELISA (EUROIMMUN, Lübeck, Germany) as well as a recombinant NS1 NS protein (The Native Antigen company, Oxford, UK) have been made available. More recently, a NS1-antigen protein microarray for the serologic differential diagnosis of flavivirus infections in horses, including USUV, has been developed and validated.117 In any case, the lately widespread occurrence of USUV throughout Europe, the relatively high avian mortality recorded, and the reported human cases make necessary the development of accurate, fast, and economically affordable specific diagnostic tools. In any case, as mentioned above, nowadays, the main preventive measures against USUV and other related flaviviral infections are prevention of mosquito bites responsible for disease transmission. These measures can be summarized as: implementation of mosquito control programs, use of insect repellents, minimization of skin surface exposed to mosquito bites, elimination of standing water where mosquitoes can lay eggs, installation of window and door screens, and minimization of outdoor activities coincident with the maximum activity of mosquitoes. An early detection of enzootic circulation based on mosquito and avian surveillance should be performed to support prevention and control measures. Recent expansion of different flaviruses, such as WNV and ZIKV, to new geographic regions has caused social alarm and demands health attention. In this sense, USUV is an obvious example for the introduction, spread, and establishment of tropical arboviruses in moderate climate. In fact, since its first detection in Europe in 2001, the wide and quick spread of USUV throughout Europe, the relatively high avian mortality recorded, and the reported human cases have made USUV a potential public health concern. Based on the previous behavior of other related arboviruses, at this moment, a risk that further large outbreaks will occur in regions already colonized by the virus, or in new regions where USUV is not yet established, cannot be dismissed. Thus, there is a need for the development of USUV-specific diagnosis tools to help clinicians to discriminate encephalitis cases of unknown etiology. In addition, further USUV circulation surveillance and control measures should be established around Europe. Likewise, although the current knowledge based on epidemiologic data and clinical manifestations of the infection does not urge to routinely test blood donations, we should be aware that additional measures may have to be implemented. Therefore, as with any other infectious emerging pathogen, multidisciplinary interventions and research that includes virologists, ornithologists, entomologists, climatologists, veterinarian, and physicians should be conducted to increase our current knowledge about USUV, and to do so, policymakers should provide and implement the adequate guidelines and funding to coordinate them between European countries. This work was supported by grants RTA2013-00013-C04- 2014, PLATESA (P2013/ABI-2906), and RTA2015-00009. 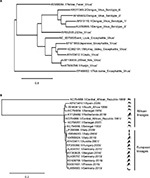 Bakonyi T, Gould EA, Kolodziejek J, Weissenbock H, Nowotny N. Complete genome analysis and molecular characterization of Usutu virus that emerged in Austria in 2001: comparison with the South African strain SAAR-1776 and other flaviviruses. Virology. 2004;328(2):301–310. Gaibani P, Cavrini F, Gould EA, et al. Comparative genomic and phylogenetic analysis of the first Usutu virus isolate from a human patient presenting with neurological symptoms. PLoS One. 2013;8(5):e64761. Nikolay B, Dupressoir A, Firth C, et al. Comparative full length genome sequence analysis of Usutu virus isolates from Africa. Virol J. 2013;10:217. Ashraf U, Ye J, Ruan X, Wan S, Zhu B, Cao S. Usutu virus: an emerging flavivirus in Europe. Viruses. 2015;7(1):219–238. Cadar D, Bosch S, Jost H, et al. Putative Lineage of Novel African Usutu Virus, Central Europe. Emerg Infect Dis. 2015;21(9):1647–1650. Liu WJ, Wang XJ, Mokhonov VV, Shi PY, Randall R, Khromykh AA. Inhibition of interferon signaling by the New York 99 strain and Kunjin subtype of West Nile virus involves blockage of STAT1 and STAT2 activation by nonstructural proteins. J Virol. 2005;79(3):1934–1942. Cadar D, Becker N, Campos Rde M, Borstler J, Jost H, Schmidt-Chanasit J. Usutu virus in bats, Germany, 2013. Emerg Infect Dis. 2014;20(10):1771–1773. Busquets N, Alba A, Allepuz A, Aranda C, Ignacio Nunez J. Usutu virus sequences in Culex pipiens (Diptera: Culicidae), Spain. Emerg Infect Dis. 2008;14(5):861–863. Ziegler U, Fast C, Eiden M, et al. Evidence for an independent third Usutu virus introduction into Germany. Vet Microbiol. 2016;192:60–66. Gaibani P, Rossini G. An overview of Usutu virus. Microbes Infect. 2017;19(7–8):382–387. Calzolari M, Chiapponi C, Bonilauri P, et al. Co-circulation of two Usutu virus strains in Northern Italy between 2009 and 2014. Infect Genet Evol. 2017;51:255–262. Hofle U, Gamino V, de Mera IG, Mangold AJ, Ortiz JA, de la Fuente J. Usutu virus in migratory song thrushes, Spain. Emerg Infect Dis. 2013;19(7):1173–1175. Cadar D, Luhken R, van der Jeugd H, et al. Widespread activity of multiple lineages of Usutu virus, western Europe, 2016. Euro Surveill. 2017;22(4). Weissenbock H, Bakonyi T, Rossi G, Mani P, Nowotny N. Usutu virus, Italy, 1996. Emerg Infect Dis. 2013;19(2):274–277. Shi PY, Li W, Brinton MA. Cell proteins bind specifically to West Nile virus minus-strand 3’ stem-loop RNA. J Virol. 1996;70(9):6278–6287. Zeng L, Falgout B, Markoff L. Identification of specific nucleotide sequences within the conserved 3’-SL in the dengue type 2 virus genome required for replication. J Virol. 1998;72(9):7510–7522. Pijlman GP, Funk A, Kondratieva N, et al. A highly structured, nuclease-resistant, noncoding RNA produced by flaviviruses is required for pathogenicity. Cell Host Microbe. 2008;4(6):579–591. Proutski V, Gaunt MW, Gould EA, Holmes EC. Secondary structure of the 3’-untranslated region of yellow fever virus: implications for virulence, attenuation and vaccine development. J Gen Virol. 1997;78(Pt 7):1543–1549. Martin-Acebes MA, Saiz JC. West Nile virus: A re-emerging pathogen revisited. World J Virol. 2012;1(2):51–70. Saiz JC, Vazquez-Calvo A, Blazquez AB, Merino-Ramos T, Escribano-Romero E, Martin-Acebes MA. Zika Virus: the Latest Newcomer. Front Microbiol. 2016;7:496. Engel D, Jost H, Wink M, et al. 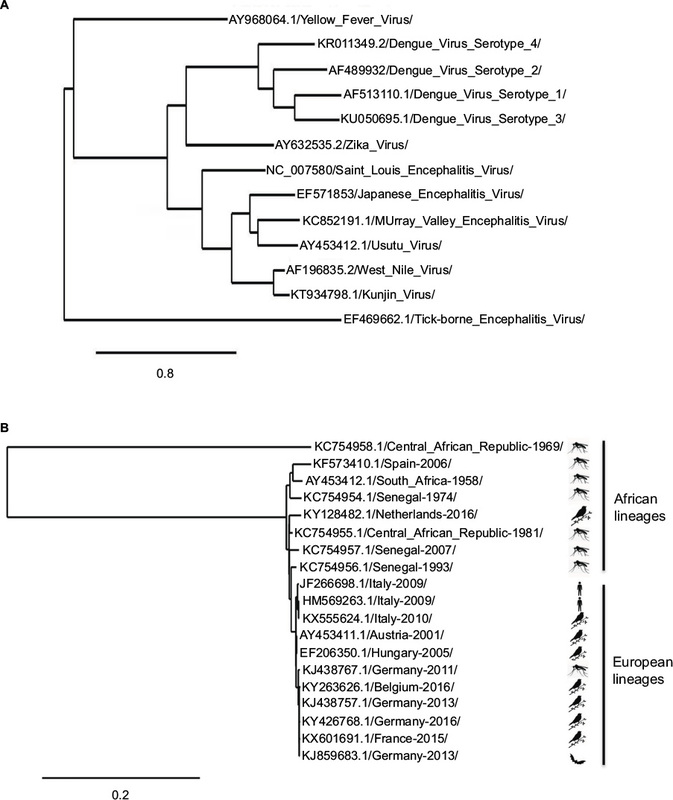 Reconstruction of the Evolutionary History and Dispersal of Usutu Virus, a Neglected Emerging Arbovirus in Europe and Africa. MBio. 2016;7(1):e01938–e01915. Winkler G, Heinz FX, Kunz C. Studies on the glycosylation of flavivirus E proteins and the role of carbohydrate in antigenic structure. Virology. 1987;159(2):237–243. Alsaleh K, Khou C, Frenkiel MP, et al. The E glycoprotein plays an essential role in the high pathogenicity of European-Mediterranean IS98 strain of West Nile virus. Virology. 2016;492:53–65. Beasley DW, Whiteman MC, Zhang S, et al. Envelope protein glycosylation status influences mouse neuroinvasion phenotype of genetic lineage 1 West Nile virus strains. J Virol. 2005;79(13):8339–8347. Murata R, Eshita Y, Maeda A, et al. Glycosylation of the West Nile Virus envelope protein increases in vivo and in vitro viral multiplication in birds. Am J Trop Med Hyg. 2010;82(4):696–704. Khromykh AA, Westaway EG. Subgenomic replicons of the flavivirus Kunjin: construction and applications. J Virol. 1997;71(2):1497–1505. Merino-Ramos T, Blazquez AB, Escribano-Romero E, et al. Protection of a single dose west nile virus recombinant subviral particle vaccine against lineage 1 or 2 strains and analysis of the cross-reactivity with Usutu virus. PLoS One. 2014;9(9):e108056. Beasley DW, Barrett AD. Identification of neutralizing epitopes within structural domain III of the West Nile virus envelope protein. J Virol. 2002;76(24):13097–13100. Heinz FX. Epitope mapping of flavivirus glycoproteins. Adv Virus Res. 1986;31:103–168. Palanisamy N, Lennerstrand J. Computational Prediction of Usutu Virus E Protein B Cell and T Cell Epitopes for Potential Vaccine Development. Scand J Immunol. 2017;85(5):350–364. Vlachakis D. Theoretical study of the Usutu virus helicase 3D structure, by means of computer-aided homology modeling. Theor Biol Med Model. 2009;6:9. Peletto S, Lo Presti A, Modesto P, et al. Genetic diversity of Usutu virus. New Microbiol. 2012;35(2):167–174. De Madrid AT, Porterfield JS. A simple micro-culture method for the study of group B arboviruses. Bull World Health Organ. 1969;40(1):113–121. Bakonyi T, Lussy H, Weissenbock H, Hornyak A, Nowotny N. In vitro host-cell susceptibility to Usutu virus. Emerg Infect Dis. 2005; 11(2):298–301. Essbauer SS, Krautkramer E, Herzog S, Pfeffer M. A new permanent cell line derived from the bank vole (Myodes glareolus) as cell culture model for zoonotic viruses. Virol J. 2011;8:339. Barr KL, Anderson BD, Prakoso D, Long MT. Working with Zika and Usutu Viruses In Vitro. PLoS Negl Trop Dis. 2016;10(8):e0004931. Salinas S, Constant O, Desmetz C, et al. Deleterious effect of Usutu virus on human neural cells. PLoS Negl Trop Dis. 2017;11(9):e0005913. Stiasny K, Fritz R, Pangerl K, Heinz FX. Molecular mechanisms of flavivirus membrane fusion. Amino Acids. 2009;41(5):1159–1163. Gillespie LK, Hoenen A, Morgan G, Mackenzie JM. The endoplasmic reticulum provides the membrane platform for biogenesis of the flavivirus replication complex. J Virol. 2010;84(20):10438–10447. Martin-Acebes MA, Blazquez AB, Jimenez de Oya N, Escribano-Romero E, Saiz JC. West Nile virus replication requires fatty acid synthesis but is independent on phosphatidylinositol-4-phosphate lipids. PLoS One. 2011;6(9):e24970. Merino-Ramos T, Jimenez de Oya N, Saiz JC, Martin-Acebes MA. Antiviral activity of nordihydroguaiaretic acid and its derivative tetra-O-methyl nordihydroguaiaretic acid against West Nile virus and Zika virus. Antimicrob Agents Chemother. 2017;61(8). Martin-Acebes MA, Merino-Ramos T, Blazquez AB, et al. The composition of West Nile virus lipid envelope unveils a role of sphingolipid metabolism in flavivirus biogenesis. J Virol. 2014; 88(20):12041–12054. Martin-Acebes MA, Vazquez-Calvo A, Saiz JC. Lipids and flaviviruses, present and future perspectives for the control of dengue, Zika, and West Nile viruses. Prog Lipid Res. 2016;64:123–137. Blazquez AB, Escribano-Romero E, Merino-Ramos T, Saiz JC, Martin-Acebes MA. Infection with Usutu virus induces an autophagic response in mammalian cells. PLoS Negl Trop Dis. 2013;7(10):e2509. Blazquez AB, Escribano-Romero E, Merino-Ramos T, Saiz JC, Martin-Acebes MA. Stress responses in flavivirus-infected cells: activation of unfolded protein response and autophagy. Front Microbiol. 2014;5:266. Martin-Acebes MA, Blazquez AB, Saiz JC. Reconciling West Nile virus with the autophagic pathway. Autophagy. 2015;11(5):861–864. Woodall JP. The viruses isolated from arthropods at the East African virus research institute in the 26 years ending December 1963. Proc E Afr Acad. 1964;2:141–146. Nikolay B, Diallo M, Boye CS, Sall AA. Usutu virus in Africa. Vector Borne Zoonotic Dis. 2011;11(11):1417–1423. Ochieng C, Lutomiah J, Makio A, et al. Mosquito-borne arbovirus surveillance at selected sites in diverse ecological zones of Kenya; 2007–2012. Virol J. 2013;10:140. Nikolay B, Diallo M, Faye O, Boye CS, Sall AA. Vector competence of Culex neavei (Diptera: Culicidae) for Usutu virus. Am J Trop Med Hyg. 2012;86(6):993–996. Vazquez A, Ruiz S, Herrero L, et al. West Nile and Usutu viruses in mosquitoes in Spain, 2008–2009. Am J Trop Med Hyg. 2011;85(1):178–181. Tamba M, Bonilauri P, Bellini R, et al. Detection of Usutu virus within a West Nile virus surveillance program in Northern Italy. Vector Borne Zoonotic Dis. 2010;11(5):551–557. Calzolari M, Bonilauri P, Bellini R, et al. Evidence of simultaneous circulation of West Nile and Usutu viruses in mosquitoes sampled in Emilia-Romagna region (Italy) in 2009. PLoS One. 2010;5(12):e14324. Calzolari M, Gaibani P, Bellini R, et al. Mosquito, bird and human surveillance of West Nile and Usutu viruses in Emilia-Romagna Region (Italy) in 2010. PLoS One. 2012;7(5):e38058. Calzolari M, Pautasso A, Montarsi F, et al. West Nile Virus Surveillance in 2013 via Mosquito Screening in Northern Italy and the Influence of Weather on Virus Circulation. PLoS One. 2015;10(10):e0140915. Rizzo F, Cerutti F, Ballardini M, et al. Molecular characterization of flaviviruses from field-collected mosquitoes in northwestern Italy, 2011–2012. Parasit Vectors. 2014;7:395. Cerutti F, Giacobini M, Mosca A, et al. Evidence of mosquito-transmitted flavivirus circulation in Piedmont, north-western Italy. Parasit Vectors. 2012;5:99. Jost H, Bialonski A, Maus D, et al. Isolation of usutu virus in Germany. Am J Trop Med Hyg. 2011;85(3):551–553. Rudolf I, Bakonyi T, Sebesta O, et al. Co-circulation of Usutu virus and West Nile virus in a reed bed ecosystem. Parasit Vectors. 2015;8:520. Figuerola J, Baouab RE, Soriguer R, Fassi-Fihri O, Llorente F, Jimenez-Clavero MA. West Nile virus antibodies in wild birds, Morocco, 2008. Emerg Infect Dis. 2009;15(10):1651–1653. Ayadi T, Hammouda A, Poux A, Boulinier T, Lecollinet S, Selmi S. Evidence of exposure of laughing doves (Spilopelia senegalensis) to West Nile and Usutu viruses in southern Tunisian oases. Epidemiol Infect. 2017:1–9. Weissenbock H, Kolodziejek J, Url A, Lussy H, Rebel-Bauder B, Nowotny N. Emergence of Usutu virus, an African mosquito-borne flavivirus of the Japanese encephalitis virus group, central Europe. Emerg Infect Dis. 2002;8(7):652–656. Buckley A, Dawson A, Moss SR, Hinsley SA, Bellamy PE, Gould EA. Serological evidence of West Nile virus, Usutu virus and Sindbis virus infection of birds in the UK. J Gen Virol. 2003;84(Pt 10):2807–2817. Buckley A, Dawson A, Gould EA. Detection of seroconversion to West Nile virus, Usutu virus and Sindbis virus in UK sentinel chickens. Virol J. 2006;3:71. Horton DL, Lawson B, Egbetade A, et al. Targeted surveillance for Usutu virus in British birds (2005–2011). Vet Rec. 2013;172(1):17. Phipps LP, Duff JP, Holmes JP, et al. Surveillance for West Nile virus in British birds (2001 to 2006). Vet Rec. 2008;162(13):413–415. Rizzoli A, Rosa R, Rosso F, Buckley A, Gould E. West Nile virus circulation detected in northern Italy in sentinel chickens. Vector Borne Zoonotic Dis. 2007;7(3):411–417. Lelli R, Savini G, Teodori L, et al. Serological evidence of USUTU virus occurrence in north-eastern Italy. Zoonoses Public Health. 2008;55(7):361–367. Vittecoq M, Lecollinet S, Jourdain E, et al. Recent circulation of West Nile virus and potentially other closely related flaviviruses in Southern France. Vector Borne Zoonotic Dis. 2013;13(8):610–613. Bakonyi T, Erdelyi K, Ursu K, et al. Emergence of Usutu virus in Hungary. J Clin Microbiol. 2007;45(12):3870–3874. Chvala S, Bakonyi T, Bukovsky C, et al. Monitoring of Usutu virus activity and spread by using dead bird surveillance in Austria, 2003–2005. Vet Microbiol. 2007;122(3–4):237–245. Meister T, Lussy H, Bakonyi T, et al. Serological evidence of continuing high Usutu virus (Flaviviridae) activity and establishment of herd immunity in wild birds in Austria. Vet Microbiol. 2008;127(3–4):237–248. Linke S, Niedrig M, Kaiser A, et al. Serologic evidence of West Nile virus infections in wild birds captured in Germany. Am J Trop Med Hyg. 2007;77(2):358–364. Hubalek Z, Wegner E, Halouzka J, et al. Serologic survey of potential vertebrate hosts for West Nile virus in Poland. Viral Immunol. 2008;21(2):247–253. Hubalek Z, Halouzka J, Juricova Z, et al. Serologic survey of birds for West Nile flavivirus in southern Moravia (Czech Republic). Vector Borne Zoonotic Dis. 2008;8(5):659–666. Steinmetz HW, Bakonyi T, Weissenbock H, et al. 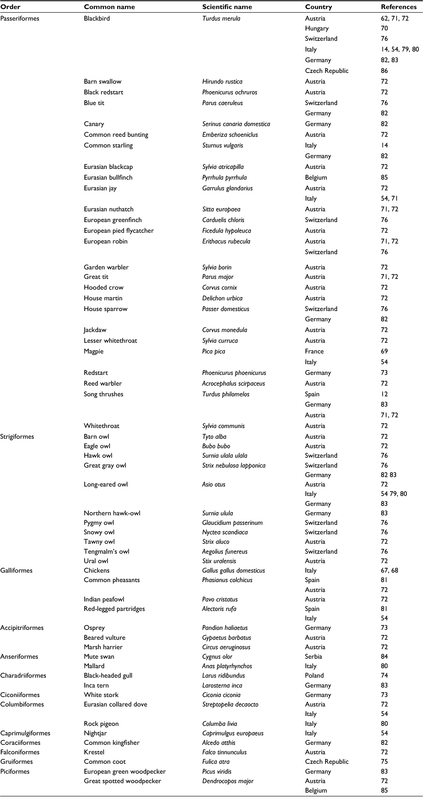 Emergence and establishment of Usutu virus infection in wild and captive avian species in and around Zurich, Switzerland--genomic and pathologic comparison to other central European outbreaks. Vet Microbiol. 2010;148(2–4):207–212. Buchebner N, Zenker W, Wenker C, et al. Low Usutu virus seroprevalence in four zoological gardens in central Europe. BMC Vet Res. 2013;9:153. Busani L, Capelli G, Cecchinato M, et al. West Nile virus circulation in Veneto region in 2008–2009. Epidemiol Infect. 2010;139(6):818–825. Manarolla G, Bakonyi T, Gallazzi D, et al. Usutu virus in wild birds in northern Italy. Vet Microbiol. 2009;141(1–2):159–163. Llopis IV, Rossi L, Di Gennaro A, et al. Further circulation of West Nile and Usutu viruses in wild birds in Italy. Infect Genet Evol. 2015;32:292–297. Llorente F, Perez-Ramirez E, Fernandez-Pinero J, Soriguer R, Figuerola J, Jimenez-Clavero MA. Flaviviruses in game birds, southern Spain, 2011–2012. Emerg Infect Dis. 2013;19(6):1023–1025. Becker N, Jost H, Ziegler U, et al. Epizootic emergence of Usutu virus in wild and captive birds in Germany. PLoS One. 2012;7(2):e32604. Ziegler U, Jost H, Muller K, et al. Epidemic Spread of Usutu Virus in Southwest Germany in 2011 to 2013 and Monitoring of Wild Birds for Usutu and West Nile Viruses. Vector Borne Zoonotic Dis. 2015;15(8):481–488. Petrovic T, Blazquez AB, Lupulovic D, et al. Monitoring West Nile virus (WNV) infection in wild birds in Serbia during 2012: first isolation and characterization of WNV strains from Serbia. Euro Surveill. 2013;18(44). Garigliany MM, Marlier D, Tenner-Racz K, et al. Detection of Usutu virus in a bullfinch (Pyrrhula pyrrhula) and a great spotted woodpecker (Dendrocopos major) in north-west Europe. Vet J. 2013;199(1):191–193. Hubalek Z, Rudolf I, Capek M, Bakonyi T, Betasova L, Nowotny N. Usutu virus in blackbirds (Turdus merula), Czech Republic, 2011–2012. Transbound Emerg Dis. 2012;61(3):273–276. Chaintoutis SC, Dovas CI, Papanastassopoulou M, et al. Evaluation of a West Nile virus surveillance and early warning system in Greece, based on domestic pigeons. Comp Immunol Microbiol Infect Dis. 2014;37(2):131–141. Lecollinet S, Blanchard Y, Manson C, et al. Dual Emergence of Usutu Virus in Common Blackbirds, Eastern France, 2015. Emerg Infect Dis. 2016;22(12):2225. Rijks JM, Kik ML, Slaterus R, et al. Widespread Usutu virus outbreak in birds in the Netherlands, 2016. Euro Surveill. 2016;21(45). Pecorari M, Longo G, Gennari W, et al. First human case of Usutu virus neuroinvasive infection, Italy, August-September 2009. Euro Surveill. 2009;14(50). Cavrini F, Gaibani P, Longo G, et al. Usutu virus infection in a patient who underwent orthotropic liver transplantation, Italy, August-September 2009. Euro Surveill. 2009;14(50). Santini M, Vilibic-Cavlek T, Barsic B, et al. First cases of human Usutu virus neuroinvasive infection in Croatia, August-September 2013: clinical and laboratory features. J Neurovirol. 2014;21(1):92–97. Gaibani P, Pierro A, Alicino R, et al. Detection of Usutu-virus-specific IgG in blood donors from northern Italy. Vector Borne Zoonotic Dis. 2012;12(5):431–433. Pierro A, Gaibani P, Spadafora C, et al. Detection of specific antibodies against West Nile and Usutu viruses in healthy blood donors in northern Italy, 2010–2011. Clin Microbiol Infect. 2013;19(10):E451–E453. Allering L, Jost H, Emmerich P, et al. Detection of Usutu virus infection in a healthy blood donor from south-west Germany, 2012. Euro Surveill. 2012;17(50). Cadar D, Maier P, Muller S, et al. Blood donor screening for West Nile virus (WNV) revealed acute Usutu virus (USUV) infection, Germany, September 2016. Euro Surveill. 2017;22(14). Vilibic-Cavlek T, Kaic B, Barbic L, et al. First evidence of simultaneous occurrence of West Nile virus and Usutu virus neuroinvasive disease in humans in Croatia during the 2013 outbreak. Infection. 2014;42(4):689–695. Maggi F, Mazzetti P, Focosi D, et al. Lack of usutu virus RNA in cerebrospinal fluid of patients with encephalitis of unknown etiology, Tuscany, Italy. J Med Virol. 2015;87(6):913–916. Cavrini F, Della Pepa ME, Gaibani P, et al. A rapid and specific real-time RT-PCR assay to identify Usutu virus in human plasma, serum, and cerebrospinal fluid. J Clin Virol. 2010;50(3):221–223. Grottola A, Marcacci M, Tagliazucchi S, et al. Usutu virus infections in humans: a retrospective analysis in the municipality of Modena, Italy. Clin Microbiol Infect. 2016;23(1):33–37. Weissenbock H, Bakonyi T, Chvala S, Nowotny N. Experimental Usutu virus infection of suckling mice causes neuronal and glial cell apoptosis and demyelination. Acta Neuropathol. 2004;108(5):453–460. Simpson DI. The susceptibility of Arvicanthis abyssinicus (Ruppell) to infection with various arboviruses. Trans R Soc Trop Med Hyg. 1966; 60(2):248–254. Blazquez AB, Escribano-Romero E, Martin-Acebes MA, Petrovic T, Saiz JC. Limited susceptibility of mice to Usutu virus (USUV) infection and induction of flavivirus cross-protective immunity. Virology. 2015;482:67–71. Savini G, Monaco F, Terregino C, et al. Usutu virus in Italy: an emergence or a silent infection? Vet Microbiol. 2011;151(3–4):264–274. Lupulovic D, Martin-Acebes MA, Lazic S, et al. First serological evidence of West Nile virus activity in horses in Serbia. Vector Borne Zoonotic Dis. 2011;11(9):1303–1305. Barbic L, Vilibic-Cavlek T, Listes E, et al. Demonstration of Usutu virus antibodies in horses, Croatia. Vector Borne Zoonotic Dis. 2013;13(10):772–774. Vanhomwegen J, Beck C, Despres P, et al. Circulation of Zoonotic Arboviruses in Equine Populations of Mallorca Island (Spain). Vector Borne Zoonotic Dis. 2017;17(5):340–346. Durand B, Haskouri H, Lowenski S, Vachiery N, Beck C, Lecollinet S. Seroprevalence of West Nile and Usutu viruses in military working horses and dogs, Morocco, 2012: dog as an alternative WNV sentinel species? Epidemiol Infect. 2016;144(9):1857–1864. Ben Hassine T, De Massis F, Calistri P, et al. First detection of co-circulation of West Nile and Usutu viruses in equids in the south-west of Tunisia. Transbound Emerg Dis. 2014;61(5):385–389. Escribano-Romero E, Lupulovic D, Merino-Ramos T, et al. 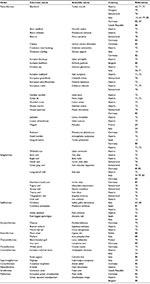 West Nile virus serosurveillance in pigs, wild boars, and roe deer in Serbia. Vet Microbiol. 2015;176(3–4):365–369. Garcia-Bocanegra I, Paniagua J, Gutierrez-Guzman AV, et al. Spatio-temporal trends and risk factors affecting West Nile virus and related flavivirus exposure in Spanish wild ruminants. BMC Vet Res. 2016;12(1):249. Odelola HA, Fabiyi A. Antigenic analysis of Nigerian strains of West Nile virus by neutralization test. Niger Med J. 1976;6(2):131–134. Odelola HA, Fabiyi A. Antigenic relationships among Nigerian strains of West Nile virus by complement fixation and agar gel precipitation techniques. Trans R Soc Trop Med Hyg. 1976;70(2):138–144. Beck C, Jimenez-Clavero MA, Leblond A, et al. Flaviviruses in Europe: complex circulation patterns and their consequences for the diagnosis and control of West Nile disease. Int J Environ Res Public Health. 2013;10(11):6049–6083. Nikolay B, Weidmann M, Dupressoir A, et al. Development of a Usutu virus specific real-time reverse transcription PCR assay based on sequenced strains from Africa and Europe. J Virol Methods. 2013;197:51–54. Del Amo J, Sotelo E, Fernandez-Pinero J, et al. A novel quantitative multiplex real-time RT-PCR for the simultaneous detection and differentiation of West Nile virus lineages 1 and 2, and of Usutu virus. J Virol Methods. 2013;189(2):321–327. Cleton NB, van Maanen K, Bergervoet SA, et al. A serological protein microarray for detection of multiple cross-reactive flavivirus infections in horses for veterinary and public health surveillance. Transbound Emerg Dis. Epub 2016 Sep 15. Diamond MS. Progress on the development of therapeutics against West Nile virus. Antiviral Res. 2009;83(3):214–227. Saiz JC, Martin-Acebes MA. The race to find antivirals for Zika Virus. Antimicrob Agents Chemother. 2017;61(6):pii: e00411–17. Merino-Ramos T, Vazquez-Calvo A, Casas J, Sobrino F, Saiz JC, Martin-Acebes MA. Modification of the host cell lipid metabolism induced by hypolipidemic drugs targeting the acetyl coenzyme a carboxylase impairs West Nile Virus Replication. Antimicrob Agents Chemother. 2015;60(1):307–315. Vazquez-Calvo A, Saiz JC, Sobrino F, Martin-Acebes MA. Inhibition of enveloped virus infection of cultured cells by valproic acid. J Virol. 2010;85(3):1267–1274. Martin-Acebes MA, Blazquez AB, Canas-Arranz R, et al. A recombinant DNA vaccine protects mice deficient in the alpha/beta interferon receptor against lethal challenge with Usutu virus. Vaccine. 2016;34(18):2066–2073.